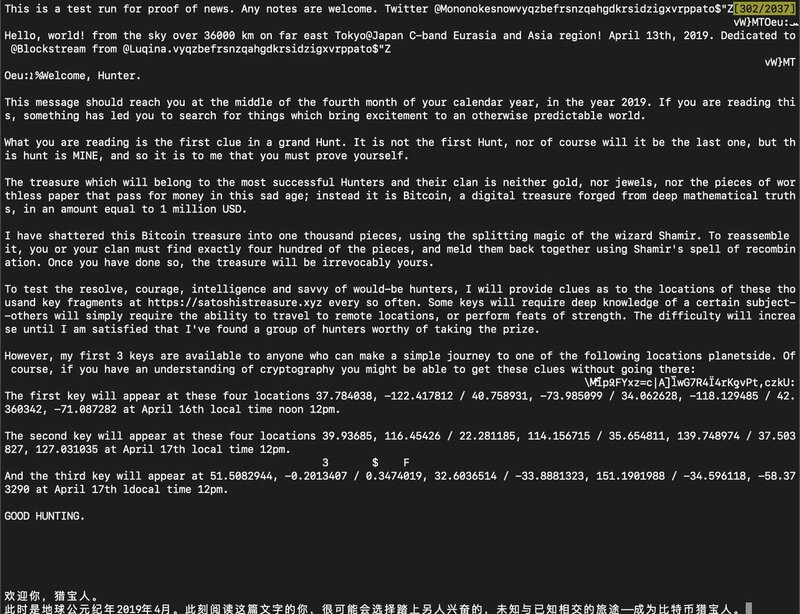 In a cryptic, rambling message broadcasted to the Blockstream Satellite on April 13, 2019, an anonymous user challenged the rest of the Bitcoin community to a million dollar hunt for what they called "Satoshi's Treasure," a contest which will "test the resolve, courage, intelligence, and savvy [sic] of would-be hunters," the game master claimed. At the current exchange rate, the contest's award is roughly 198 BTC. "This message should reach you at the middle of the fourth month of your calendar year, in the year 2019," the message read. "If you are reading this, something has led you to search for things which bring excitement to an otherwise predictable world." "What you are reading is the first clue in a grand Hunt," according to the message. "It is not the first Hunt, nor of course will it be the last one, but the hunt is MINE, and so it is to me that you must prove yourself." The message also laid out the ground rules for the treasure hunt in enigmatic terms and noted that the final prize is "neither gold, nor jewels, nor the pieces of worthless paper that pass for money in this sad age." The game master fractured the final million dollar bitcoinucopia into one thousand pieces, using the "splitting magic of the wizard Shamir." Treasure hunters must find 400 of these pieces and use Shamir's "spell of recombination" to seize the hoard of digital gold. "Once you have done so, the treasure will be irrevocably yours," the message proclaimed. While the reference to Shamir might sound like a character from Magic: The Gathering or Dungeons & Dragons, it's actually a reference to Israeli cryptographer Adi Shamir, who invented the secret key sharing mechanism that the game master's hunt is likely employing to split the bitcoin stash's private key into multiple shards. 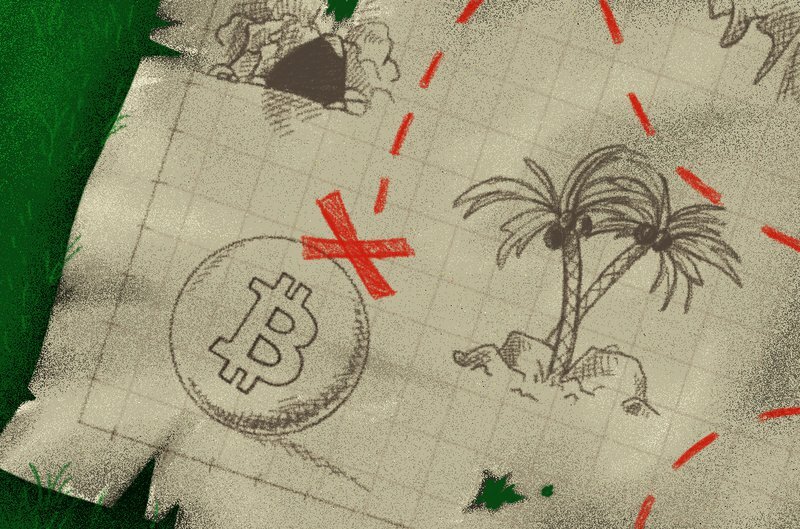 Satoshi's Treasure enters a tradition of similar puzzles and games whereby anonymous enthusiasts - whether by virtue of generosity, curiosity, boredom or all three - embed reference to bitcoin private keys in art, pictures or other forms of media. The most recent of these took place in France, when $1,000 worth of bitcoin was hidden inside a recreation of the famous "Liberty Leading the People." Perhaps the most famous example of such puzzles, The Legend of Satoshi Nakamoto, was cracked in early 2018 after stumping would-be solvers for three years.